Since manholes and sewer vents come in many shapes and sizes, some information is needed before a Manhole Odor Eliminator can be quoted and ordered. Click the above link for a step by step guide for your treament needs. 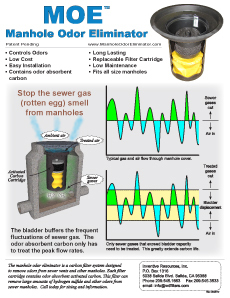 Click here to download the Manhole Odor Eliminator brochure. Copyright © 2016 Inventive Resources Inc. | The Manhole Odor Eliminator. All rights reserved.